Left to right: The doorway, with birds and butterflies painted on and around the arch. 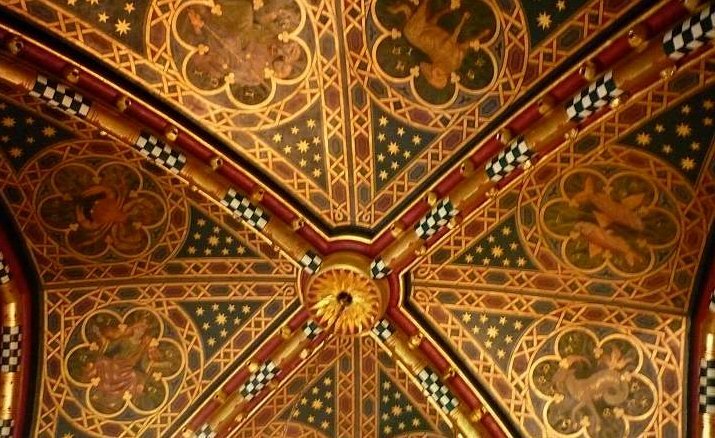 The gilded ceiling displaying signs of the zodiac.Two sculpted, highly painted and richly gilded representations of the sun. The walkway along the castle wall to the Clock Tower gives access to the suite of rooms designed for the Marquess before he was married. It contains the celebrated Summer and Winter Smoking Rooms, a bedroom with bathroom, and so on. The Summer Smoking Room, with its gallery, is most often described, but the Winter Smoking Room is also extravagantly decorated. 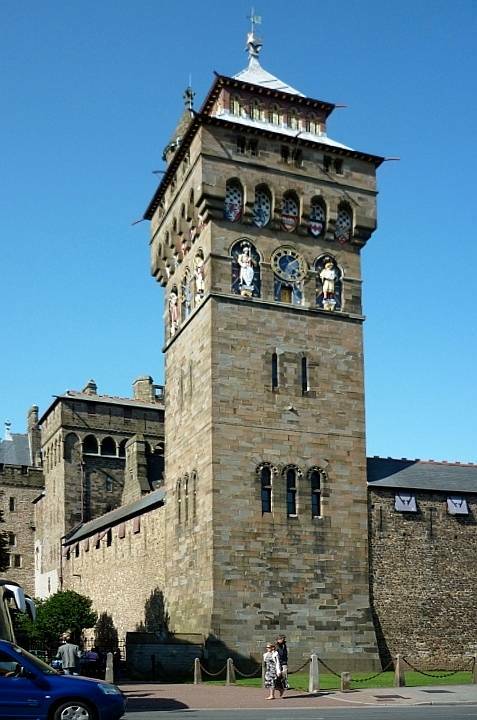 As on the outside of the tower with its clock faces and planets, the theme is that of time passing. 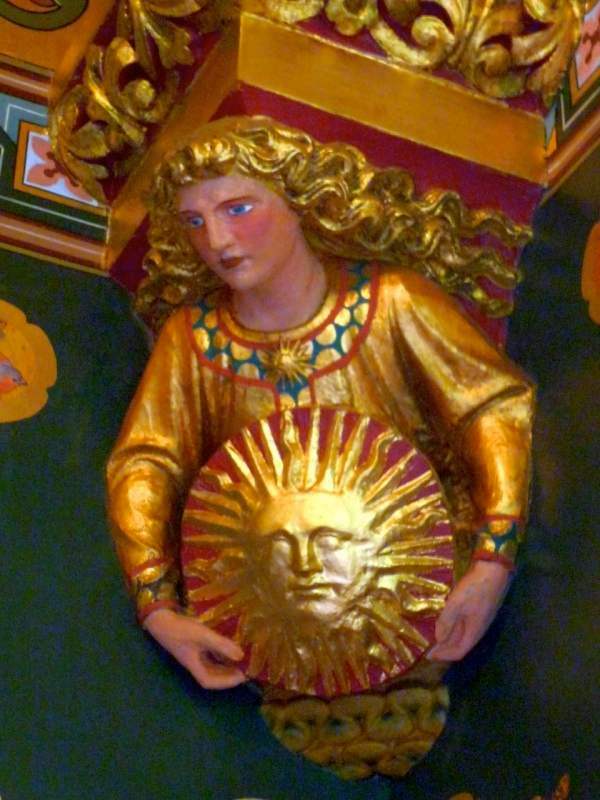 Signs of the zodiac are painted on the ceiling and sun motifs appear in the wall decoration. Left to right: The whole fireplace, with overmantel and hood. 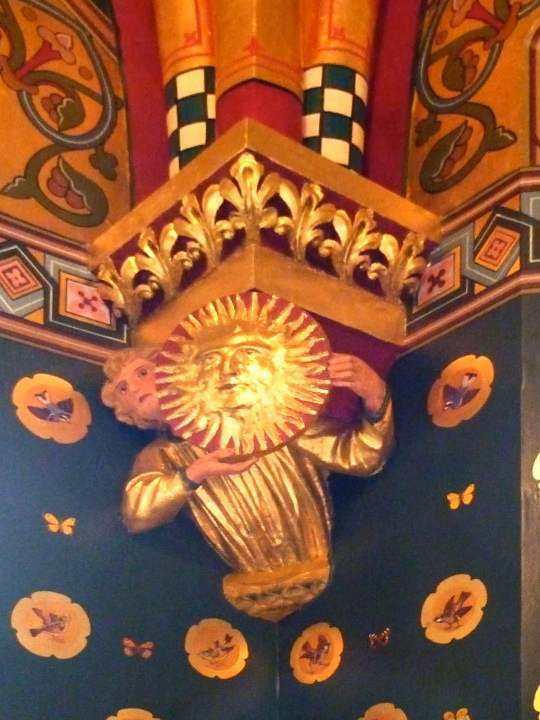 A close-up of the fireplace hood, with the well-known quotation from Virgil below it: "Love conquers all; let us yield to love." An autumnal scene in the wall-frieze beside the hood: people in medieval garb shake down and collect apples from a tree. The smoking and drinks cabinet. 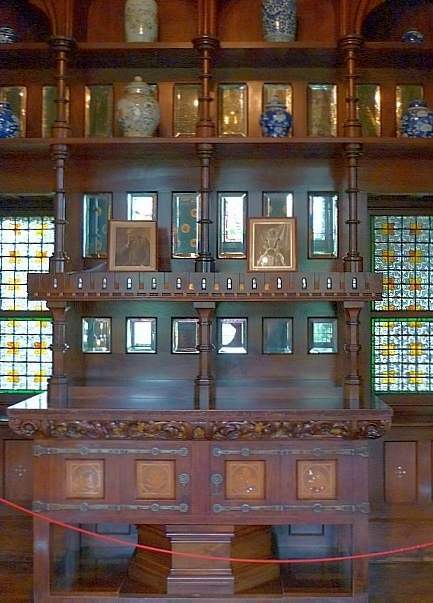 A hugely decorative fireplace displays scenes of medieval life, while a richly carved and ornamented cabinet with mother-of pearl inlays has room not only for cigars and smoking accessories but also for up to forty bottles of drink. 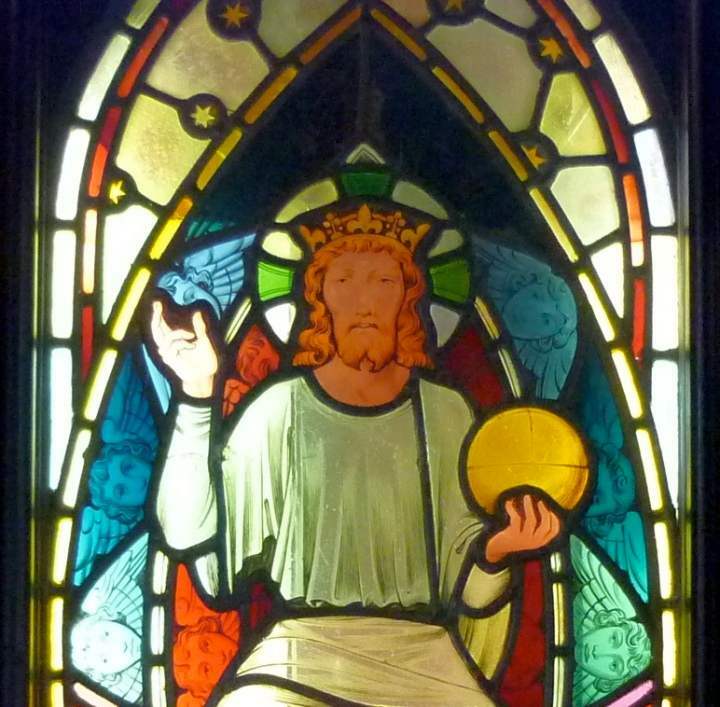 To offset the secular and even pagan aspects of the room, there are also stained glass windows such as you might find in a church. Nature too has its place here. 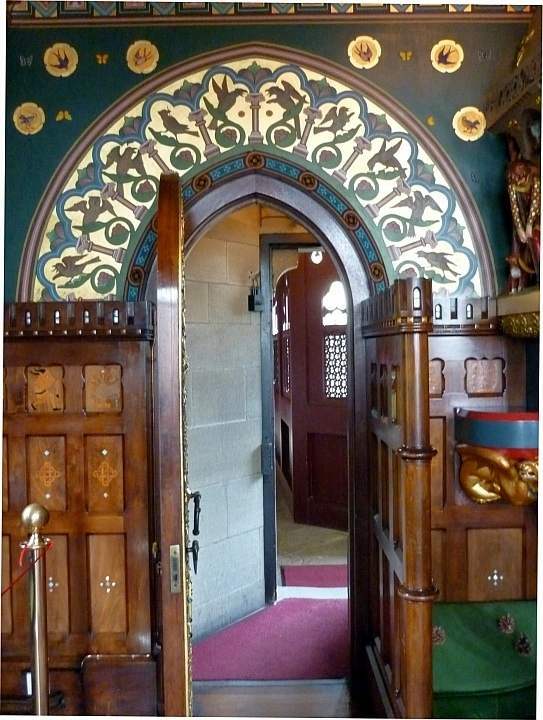 Burges was especially fond of birds and other small creatures: as well as the painted birds flying around the doorway, the wooden panelling has amusing pictures of animals, along with Celtic designs. Left to right: The figure of Joseph from a stained glass triptych. 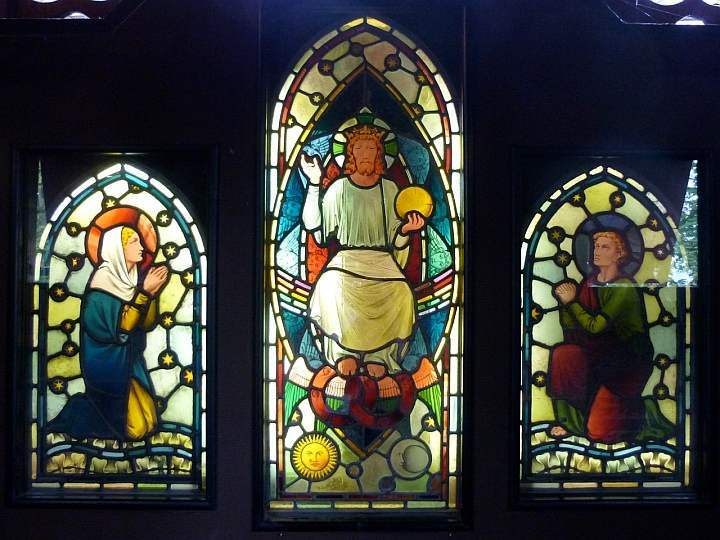 A whole, different stained glass triptych. A detail of Jesus from the middle panel of this triptych. 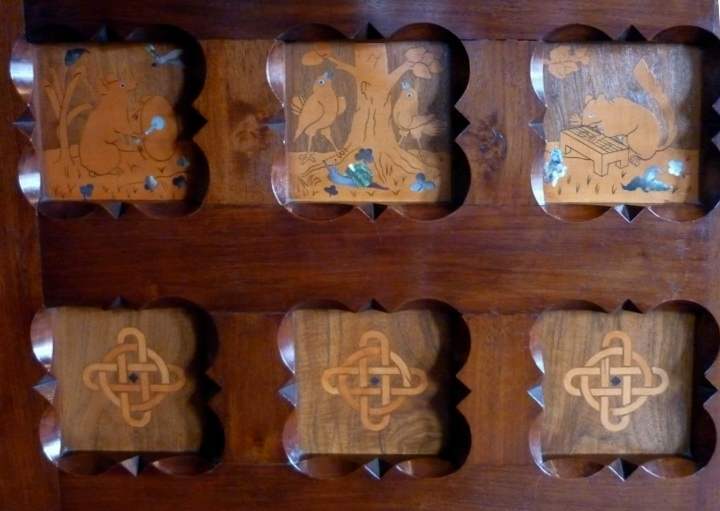 Wood panelling with Celtic designs and scenes of mice playing musical instruments; in the middle here is a scene of birds singing beneath a tree, while a snail passes safely by. According to Jan Marsh, Burges was an early visitor to William Morris's Red House in the summer of 1861, and was influenced by the "riot of colours and rich decoration" there (53). 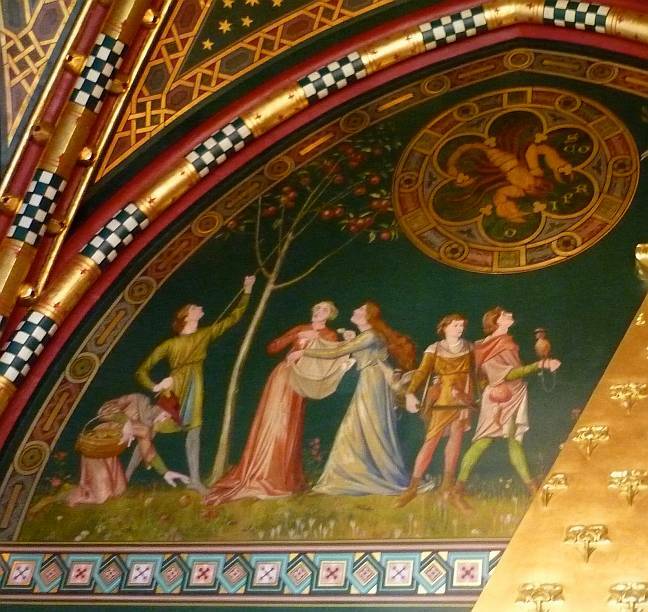 Red House would certainly have appealed to him with its wall-hangings, stained glass, solid wooden furniture and so on, and the medieval scene on the wall here, of folk collecting apples in autumn, seems particularly reminiscent of Red House with its orchard. 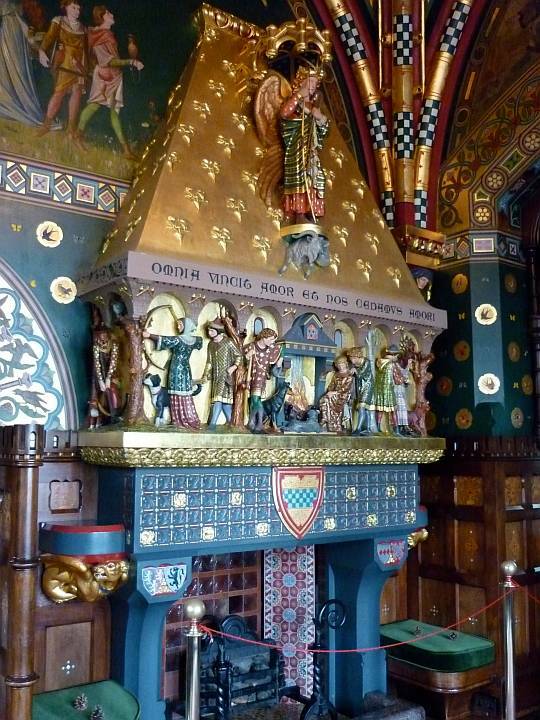 But Burges's interiors at Cardiff Castle lack the home-spun feel, are drawn from a greater variety of sources and are generally much more lavish and elaborate. Crook, J. Mordaunt. "Burges, William (1827-1881)." Oxford Dictionary of National Biography. Online ed. Viewed August 2009. Crook, J. Mordaunt.The Dilemma of Style: Architectural Ideas from the Picturesque to the Post-Modern. Chicago: University of Chicago Press, 1987. Crook, J. Mordaunt.William Burgess and the High Victorian Dream. London: Murray, 1981. Long, Helen. The Edwardian House: The Middle-Class Home in Britain, 1880-1914. Manchester: Manchester University Press, 1993. Marsh, Jan. William Morris & Red House: A Collaboration between Architect and Owner. London: Anova Books, 2005. Muthesius, Stefan. 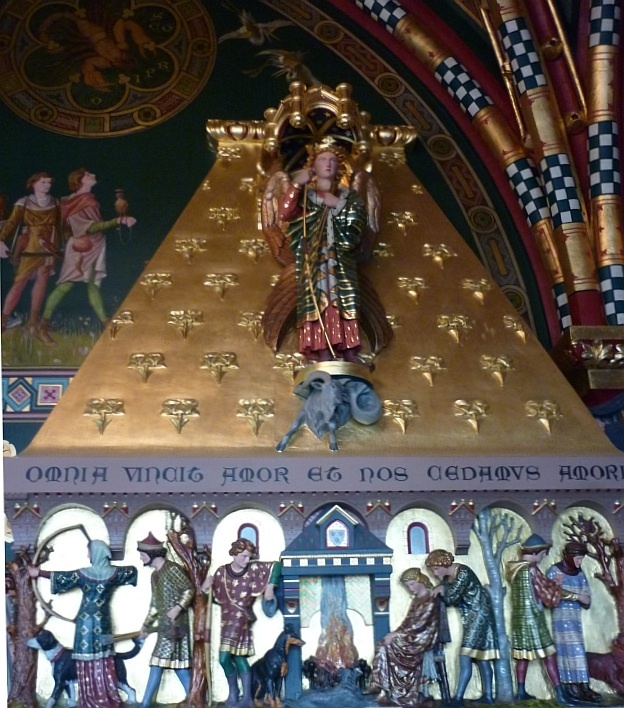 The High Victorian Movement in Architecture, 1850-1870. London: Routledge, 1972. Norwich, John Julius, ed. Treasures of Britain: The Architectural, Cultural, Historical and Natural Heritage of Britain. Windsor: AA/Everyman, 2002.